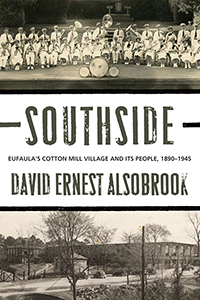 SOUTHSIDE relates the stories of the cotton mill workers and their families who lived and worked in Eufaula, Alabama, a small town on the Chattahoochee River, from the 1890s through 1945. Utilizing previously unpublished family records, oral histories, and other primary sources, author David Alsobrook relates the stories of the lives of these ordinary mill families—their hopes, dreams, joys, and tragedies. Readers will discover that many Southsiders closely resemble their own families. The Cowikee Mill Community House, established in 1918, provided a variety of recreational and educational programs for Southsiders—bands, baseball teams, a kindergarten, Scout troops, and social clubs. The Community House and the two “mission” churches became the centers of social life in Southside. After the 1920s on, the popularity of Community House programs throughout Eufaula expedited the eradication of the barriers of caste and class between textile families and other residents. The book also provides an in-depth historical examination of Eufaula’s race relations, racial violence, and the impact of the Civil War and the Myth of the Lost Cause on the town’s future evolution. Readers who are interested in the Great Depression and World War II will find much detail about these eras, how they dramatically altered the lives of everyone in this small town, and abolished the antiquated system of ostracism of mill families. Many of the photographs that appear in Southside are from personal family collections and have never been seen previously. Alsobrook’s chapter on legendary mill owner Donald Comer presents a fresh assessment of this remarkably enlightened corporate executive and his own particular brand of paternalism, which differed significantly from the philosophy of many of his contemporaries in the Southern textile industry. A most enjoyable Local History Book that is very easy to read again and again.